For some reason I recently had to wipe something off of one of the windows in the shop and was astounded at the resultant change. So I picked up a wetted sponge and placed a drop of detergent on it and scrubbed the whole thing. Wow! I’m guessing you can discern which of the four windows this was. I immediately asked myself, “Self, when did you clean the windows last?” So I answered, “Self, I am pretty sure they were cleaned when Craig and I built the frames and installed the glass back in 2008.” Further self-interrogation did not reveal any window housekeeping during the intervening decade. Another thing goes on my “Do/Make/Buy” list hanging in the shop. One window down, 67 to go. 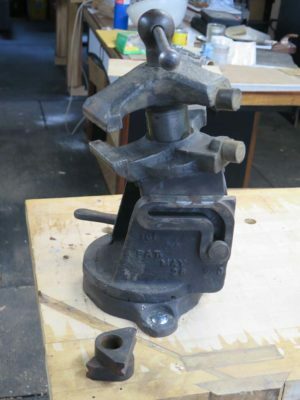 When I recently removed the generic end vise and mounted instead the ~125 lb. Emmert Universal Vise in its place, one piece of a convoluted equation began to take shape. 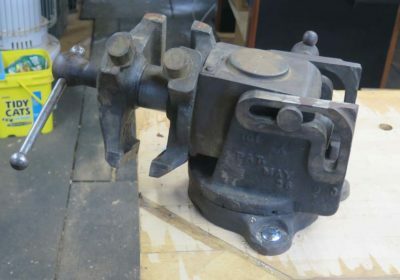 I knew the vise needed a robust platform and this little-used bench performs the function perfectly. 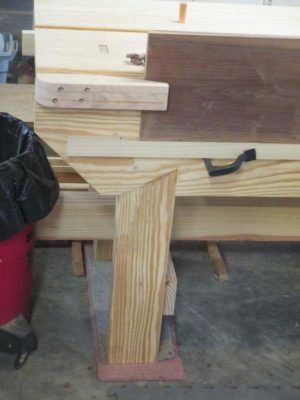 A third component in the equation was a beloved niece-in-law had expressed an interest in learning woodworking (actually I have four beloved nieces-in-law, but this is one in particular). The odds are pretty good the second of the petite Roubos I built originally for my Handworks booth would eventually end up in their apartment. So, I removed it from the critical space it occupied adjacent to my third child before it became too disruptive to do so. I moved that little bench down into the newly opened space, for the time being. 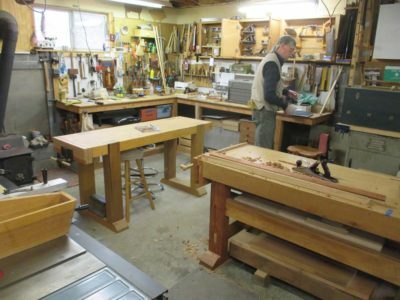 Since nature abhors a vacuum something needed to go into that space previously occupied by the petite Roubo. 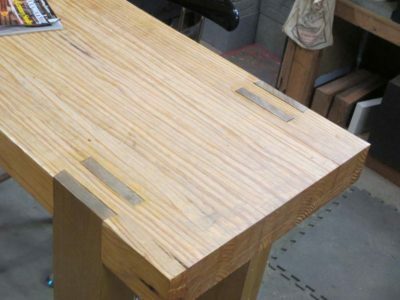 Hmm, I really did like having a metalworking-ish bench in the middle of my herd of woodworking benches… Palm, meet forehead. 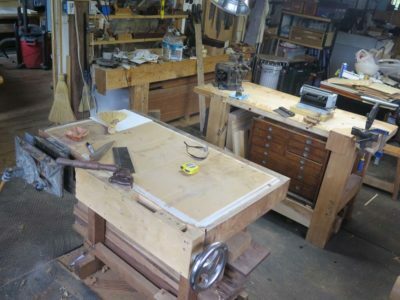 Soon I had the old, almost extraneous Roubo bench relocated, revived and recommissioned, sitting where it will be used daily. 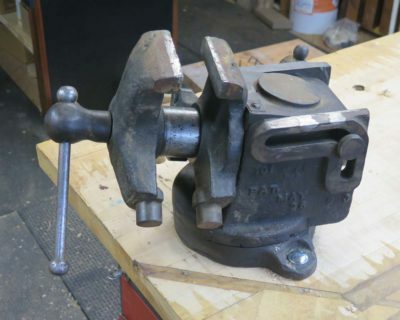 I removed the second vise and stocked the space underneath with a lot of my mechanicky tools. 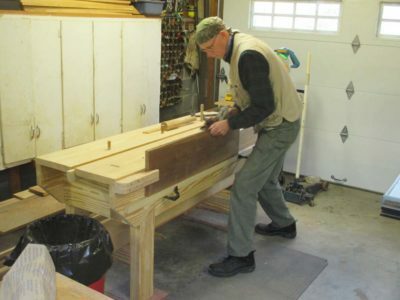 I have additional plans for this bench which I will chronicle when they unfold. 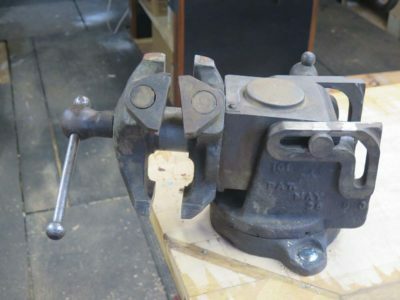 Here is a gallery of the Emmert Universal Vise showing off its moves. Recently I was back in Mordor and had the chance to visit with my old pal Tom. 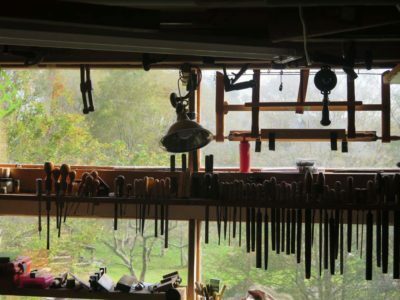 I first met Tom at a community flea market, he was selling tools and I was looking. 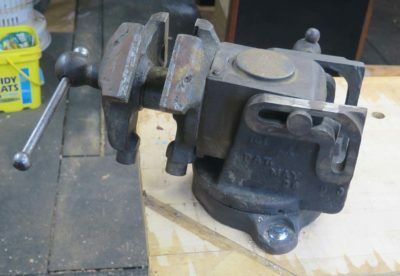 I waited too long to get what I wanted from his table, but in our subsequent conversation he indicated he had another one and I could have it in exchange for some lessons in lathe-work. That started a decade-long tradition of my spending Wednesday evenings in his spacious and well-equipped shop. It seems even more spacious now since my projects are no longer there taking up space. My reply was generally something like, “Sweetie, we are guys. 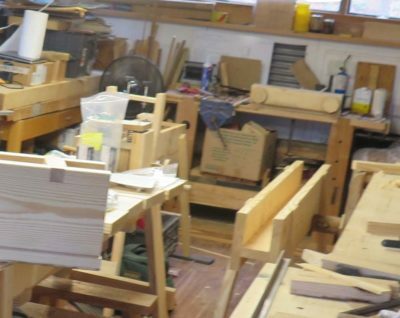 We didn’t talk about anything but woodworking.” Wednesday nights were often dedicated to building workbenches and sharpening tools. 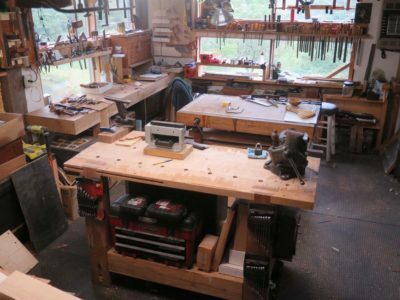 Since I moved to Shangri-la Tom has built some new workbenches (I was really impressed with both his Roubo-esque bench and a terrific little Nicholson) and has started some new projects, but going there was a welcome homecoming of sorts. 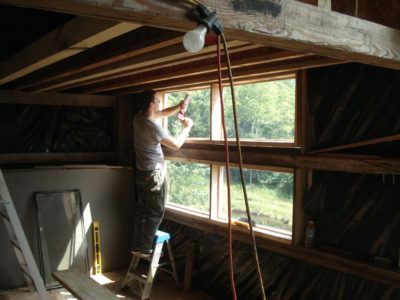 He visits me here with some regularity, at least a couple times a year, and he like so many others was crucial in the completion of the barn. He has his own bench here, autographed by The Schwarz. While driving to Tom’s shop I did notice that a regal oak tree along the driveway had come down. It was at least 25-feet in girth. For scale of the picture, imagine me standing next to this wreckage with my hand straight over my head. It would have not reached the top of the horizontal trunk. 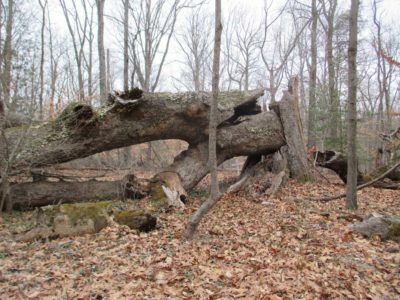 As you can tell, the tree was a mere shell of itself by the time it came down, with the core hollowed out by disease and rot. 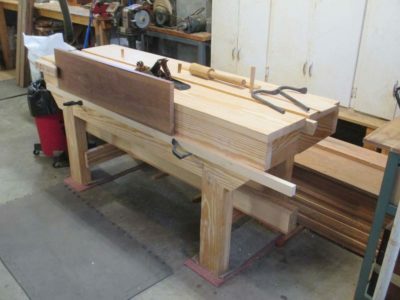 We spent most of the afternoon going to our favorite local sawmill where I placed an order for 300 b.f. of clear southern yellow pine, just to add to the inventory. The price has jumped since I last bought some clear SYP eight years ago, skyrocketing 33% to 60 cents a board foot! I’ll pick up the order in three weeks and it will be ready to use next spring. After much consideration I decided to upgrade the heating in the barn studio. 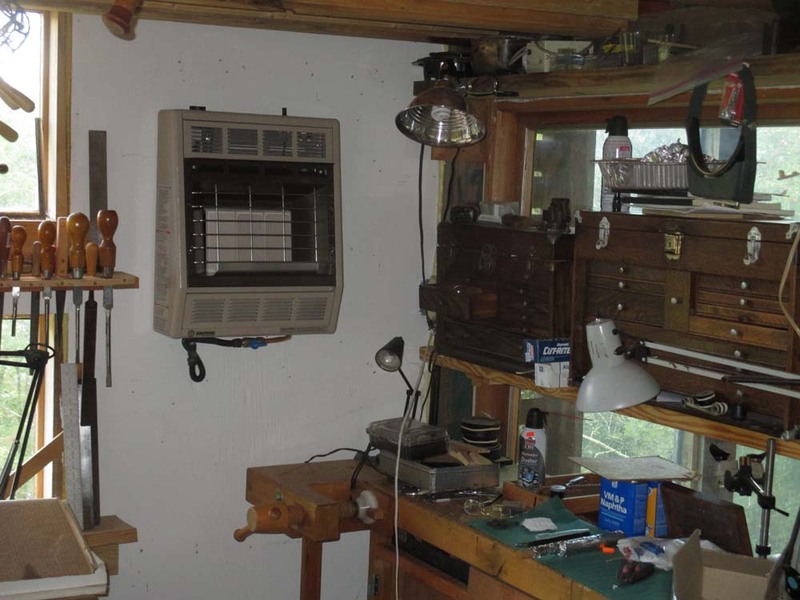 While my existing system of a premium wood/coal stove in the basement combined with a kerosene heater in the studio provided plenty of heat, two problems needed addressing. For starters, the kerosene heater consumed about 1-1/4 gallons of kerosene for a full day’s heat, at a cost (last winter) of about $5/day. Not a killer, but not irrelevant. Second, and more significant, was that I have never perfected the knack of keeping the wood/coal stove in the basement burning all night. Thus even though the shop space is super-insulated, every morning when I arrived in the shop, given the usual howling winds here its temperature would be close to the outside ambient temperature. This meant that a great many mornings the shop was in the single digits, and it took a very long time for the stove and heater to get the space and its mass of contents up to an acceptable temperature. My late afternoons were cozy and comfortable, toasty even, but the mornings were mighty brisk. With that in mind I selected a heavy duty Empire three-panel radiant heater, fueled by propane. It was installed last week, and on its test run made the space uncomfortably hot in short order. The propane service fellow (actually a good friend of mine named Brad) thinks that given the volume of the space and the super insulated walls and ceiling, I should be able to make through the entire winter on a single 80-gallon fuel tank, or about $175 worth of fuel. This works out to about $1.25 a day. My strategy is to keep the propane heater set at about 40 degrees, just enough to keep the space warmer than freezing and much easier to heat up with the wood/coal stove in the morning. I’ve also purchased a bunch of transparent shower liner curtains to close off one end of my shop, a space where I do not need immediate access most days. Reducing the volume of air being heated by 25% should have a beneficial impact on the micro climate. Since the heating season in the mountains will begin in about a month, I should be able to report back on the efficacy of the new arrangement soon.